Anacare Reviews and Testimonials. Read our latest customer testimonials. Read what our customers told us about Anacare. The following testimonials are genuine, unpaid testimonials/reviews we have received from Anacare (and formerly Analcare) customers. *After 3 days of use I have had my first full nights sleep without waking up to itch. I have tried every OTC treatment and nothing has worked, in fact I think I've used them too long and everything got worse! 3 days of Anacare and I can already see and feel a huge improvement. I also jog and have an under-bra sweat rash - I thought I'd rub a small amount of Anacare onto the rash last night because it was itching like crazy and within minutes that stopped too. Great product and I will definitely buy another supply. *I've been suffering for about 10 years now, applying 'over the counter' remedies on a daily basis to avoid sleepless nights and itching impulsively in public. 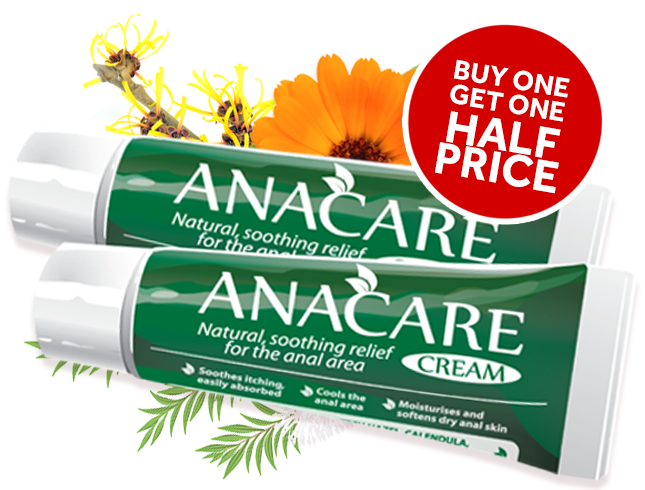 Applying Anacare (a month or so in) has meant that sleepless nights are now a thing of the past, impulsive uncontrollable itching also not a problem anymore. I don't have to apply every single day, without fail. Marvelous stuff, just ordered another two tubes as I'm a 40 year old hairy man so the problem will never disappear but is so so much better with this stuff as I don't have to ensure the I apply every day to stop the misery. *After one year of suffering, finally I got rid of itchy bottom which was so annoying and embarrassing. I went several times in GP but the doctors couldn't help me out. I was being totally helpless, couldn't slept all nights. I tried different medications recommended by the doctors but it went even worse. I felt so uncomfortable by going out with the friends because every time I had to go to the toilet to give it a quick scratch even in the workplace. I was every time searching in the google for the remedy. So it really became a miracle when I had the dear anacare in my hand. Oh god, I can't describe how I felt when I applied it for the first time and the night I went to the bed. It seemed like I was having the relaxation night after ages. Then after within a week I went back to the normal. The textures inside the cream was really amazing. I was so so happy that I can't express here and really really want to say thank you for the wonderful creator of this beautiful product. Even my thank you is not enough here. So that was my poor story. So if you guys are having the similar problems that I was having, I would strongly recommend you to apply this product without any doubts. Thank you anacare once again! *The service from this company is absolutely wonderful. The Product is superb and certainly helps with the pesky piles. I am still suffering but very much improved and certainly will continue use to see whether i can eliminate them completely. Thank you for you wonderful care to all of us who suffer in silence. *I cannot recommend your company highly enough, the product is excellent! From having severe pain and bleeding a few months ago I now find that although I do still use your product that I only need to use it occasionally. Your service is as good as Anacare itself, ordered on Wednesday at 10.45pm, order arrived at 11am on Friday morning, can't see how it could be bettered. *After 5 years of suffering with Pruritus Ani, numerous visits to doctors and medical professionals, at least 15 different creams without any relief at all i found Analcare by chance while online and at first was sceptical about trying another cream as in the past i’ve always been left disappointed. This cream is simply THE BEST. It really does work and i’ve just ordered some more, to be honest i would pay 10 times the price it cost, it is that good. Thank you from the bottom of my heart. *I always suffered from piles, but only about 2 years i started having them bleed. I used various products that worked for a couple of days and then they bleed and no matter what i used it wont stop. Even though i knew it was nothing wrong apart from piles it wasn't a pleasant visual to see after having a bowel movements. Luckily enough i came across this product online and i said to myself i have nothing to loose, even though i didn't believe it would work, how wrong was I. I started feeling my piles shrinking and from then onward for the first 4 tubes i used to then see once blood every month or so. I have now been using this product for about 6 month and to date the last time i have seen blood is 3 months ago. I use it daily and i always make sure i have enough stock. Delivery is very quick even though i am from overseas and i order them in fours. The price for what is it is excellent but just a few more pounds that the cheap stuff you find costs. *Thank you for your product, I have tried a number of creams, some prescribed which have not given me the relief I have had with your cream, would recommend it for everyone, especially as it is which is all natural is in my view a big plus, well done, would be interested in hearing if you decide to extend your range. *Results can vary from person to person but remember if Anacare does not work as well for you as it has for others simply return the product for a full purchase price refund.